Filters require that a set of weights be applied to data. The weights may be applied in the spatial (eg, smth9) or time domains. The focus of the following examples will be on application to the temporal domain. The filwgts_lanczos function may be used to create a set of weights that have characteristics specified by the user. The wgt_runave or wgt_runave_Wrap functions can be used to apply the weights. The use of wgt_runave or wgt_runave_Wrap will result in the loss of data at the beginning and end of the series being filtered. There is no way to avoid this data loss. Each Lanczos filter will have an associated response function. This shows how weights which are applied in the (say) time domain will affect amplitudes in the frequency domain. Often, the phrase half-power point is used to describe the overall effectivesness of a filter. This is the frequency (period) at which the power or variance is 50% of maximum. 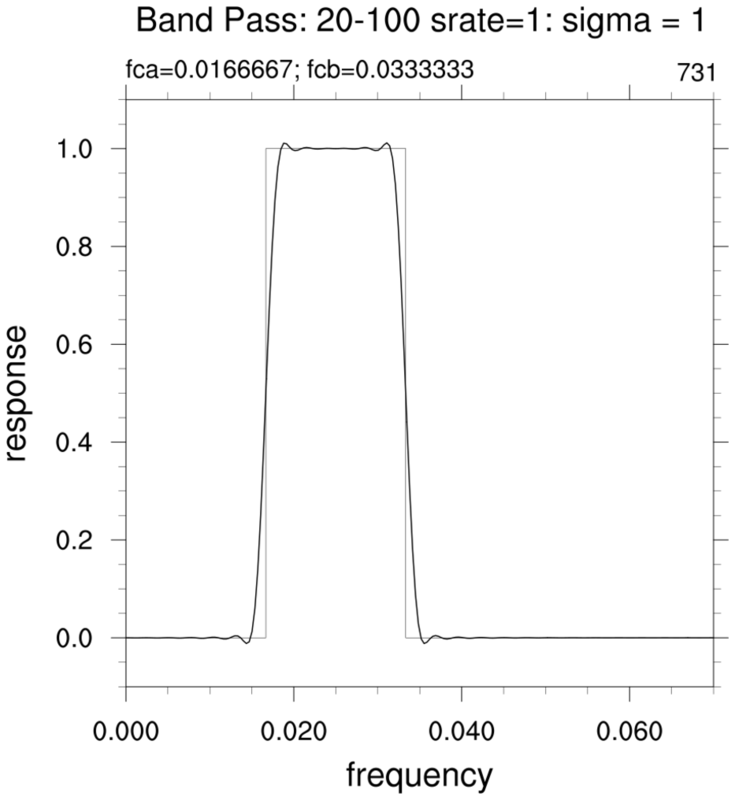 This is the frequency (period) at which the amplitude response is 0.707 [0.707^2=0.5]. Note: Be aware that the frequency at which the amplitude response is 0.5 is sometimes referred to as the half-power point. This is not correct. NCL's filter functions operate over discrete time steps in a time series. Their time metric is time steps, *not* calendar time or real time. This is a common point of confusion about digital filters. Therefore, the filters *do not care* about your time units or time coordinate variable. To get correct filter parameters, you must manually (or with clever programming) express your time domain parameters in terms of *time steps*. 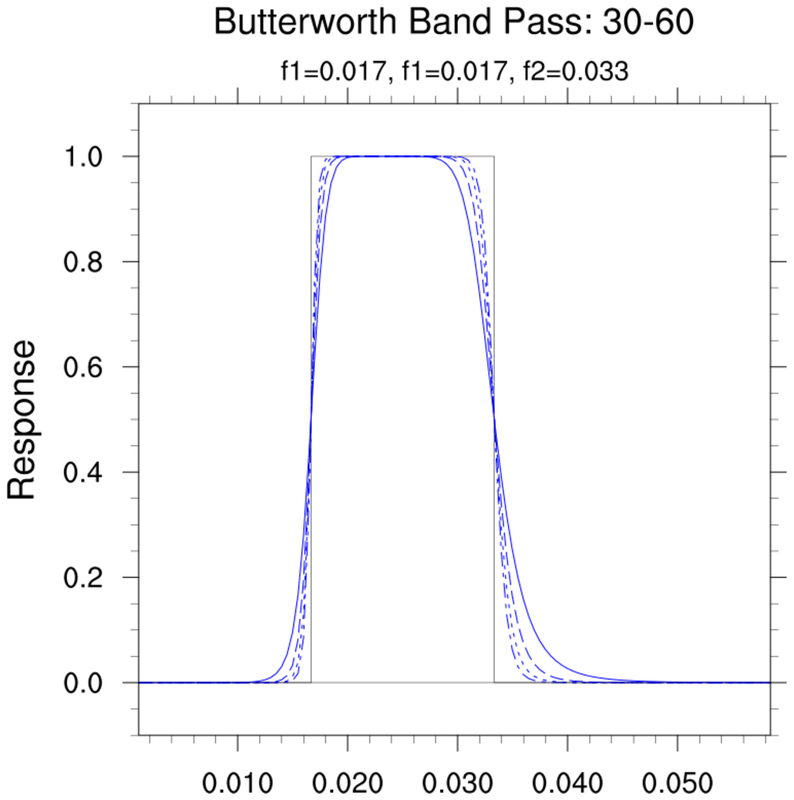 The Butterworth filter is a signal processing filter designed to have as flat a frequency response as possible in the passband. NCL has a function bw_bandpass_filter which is optimized for narrow band applications. 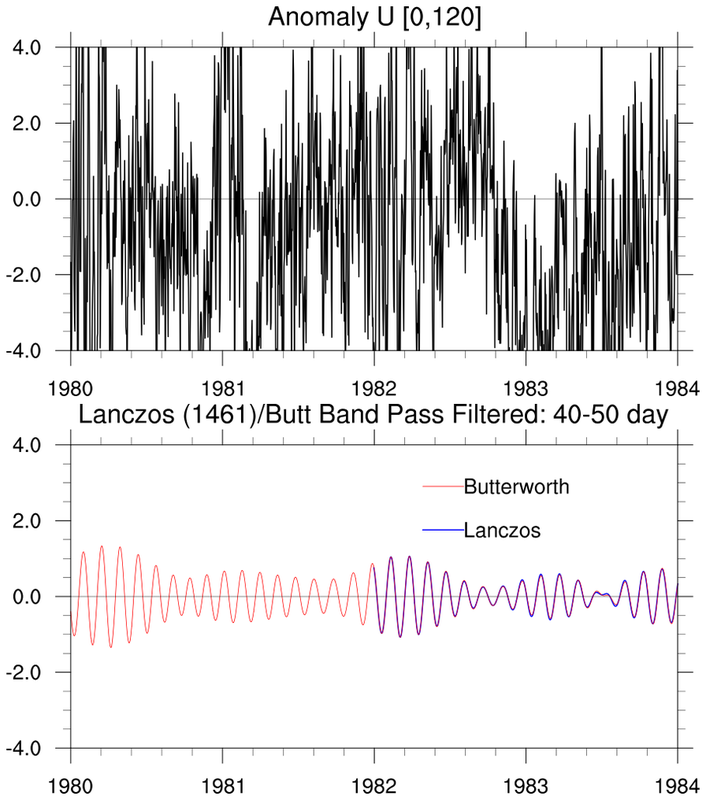 Figures which show the response functions of Lanczos or Butterworth (V6.3.0) filters also show the ideal filter response in the frequency domain. 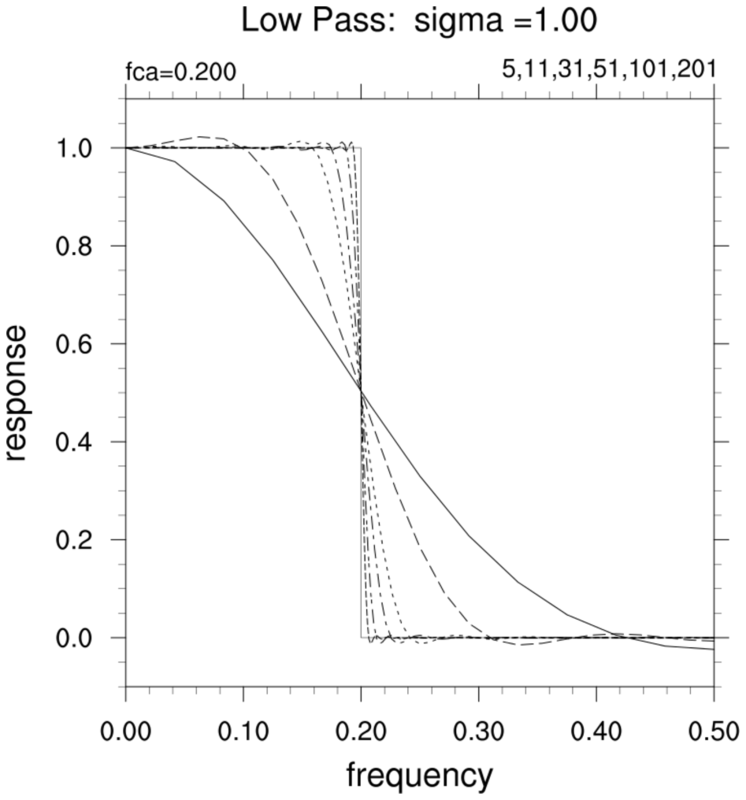 For band-pass filters, this ideal response is sometimes referred to as the 'boxcar' response. Lanczos Response Function: The filters_8.ncl script will generate one or more response functions for different Lanczos filter lengths. See Example 8. 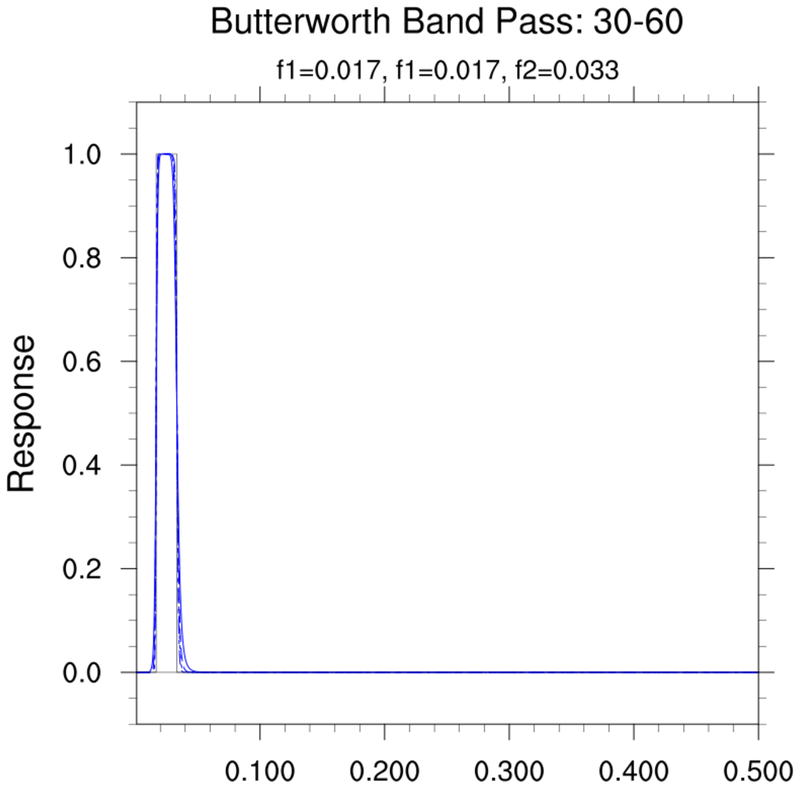 Butterworth Response Function (6.3.0): The filters_9.ncl script will generate one or more response functions for different Butterworth pole values. filter_1.ncl: Reads in a variable from a netCDF file, averages all latitudes between 15S and 15N, applies a user specified filter on the "time" dimension, and creates a color Hovmueller diagram. gsn_csm_hov is the graphical interface that creates Hovmueller diagrams. 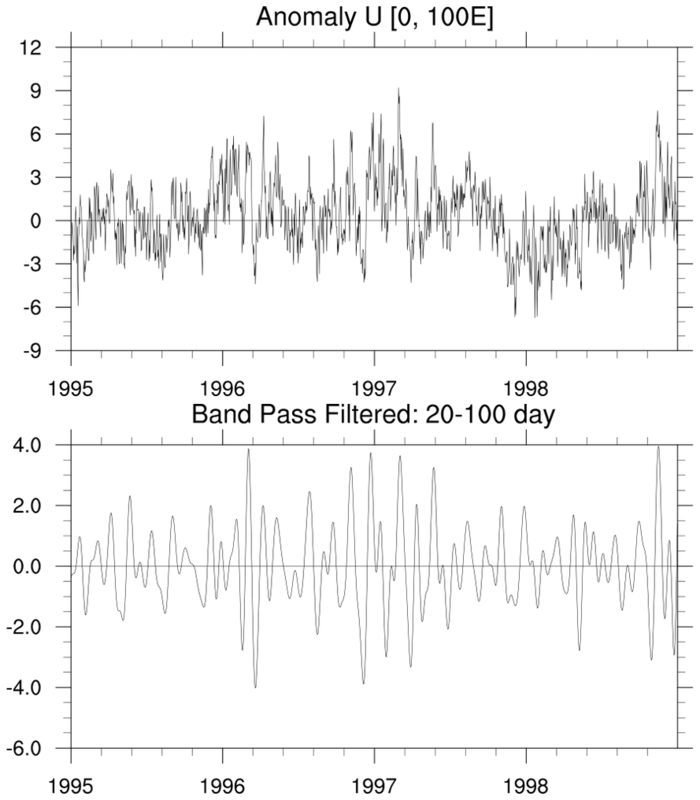 Using different filter lengths (49 [solid], 121 [dashed]), generate two low pass filters that (ideally) will remove fluctuations less than 24 months (2 years). 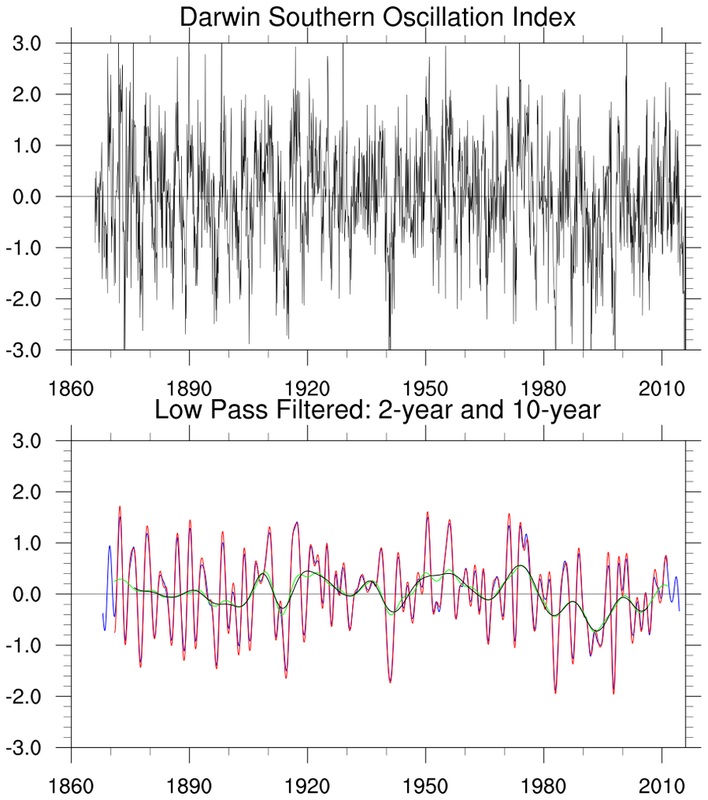 Using different filter lengths (121 [solid], 241 [dashed]), generate two low pass filters that (ideally) will remove fluctuations less than 120 months (10 years). The blue (49 weights) and red (121 weights) curves are for the 24-month filter. In this case, not much was gained by using much longer filter (121 vs 49). Also, using the 49-point filter returned more data at the ends. The green (121 weights) and black (241 weights) curves are for the 120-month filter. The response functions are not much different and, as a result, the decadal curves are not much different. Generate and apply a 20-100 day band pass filter using 201 weights. The response function for the filter is also shown. The Lanczos filter weights are applied to the entire daily series spanning 1980-2005. The plotted values do not have any missing points 'end-points' because the plotted time period (1995-1998) is a subset of the entire series. This example compares results returned using filwgts_lanczos and FFTs [ezfftf and ezfftb]. 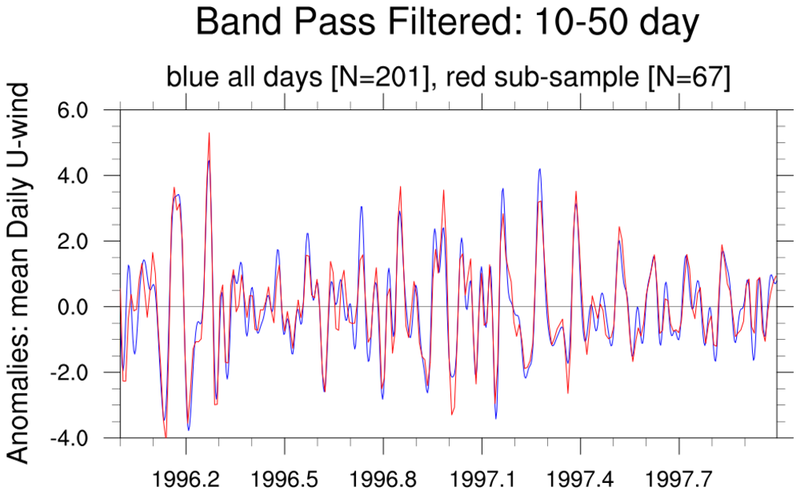 The band pass period for this example is 30-to-60 days. 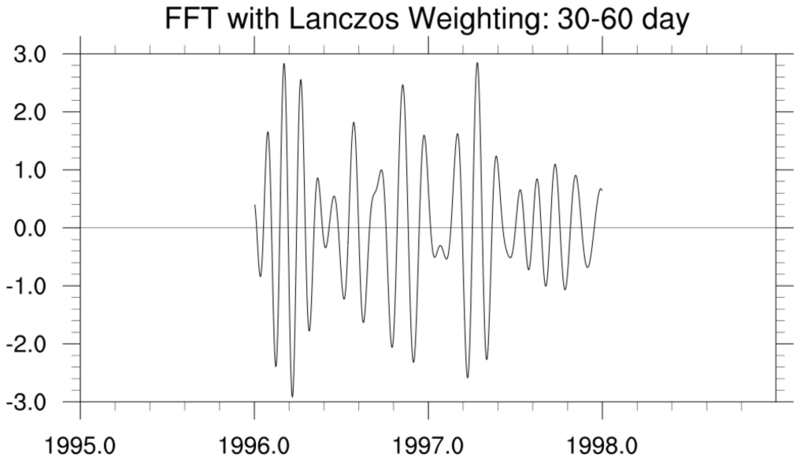 The FFT filtering is performed by applying a 'boxcar' cutoff in frequency space (1/30 and 1/60) while the Lanczos weights are applied in time. The Lanczos band pass filter in this example is 731 points. This means that exactly one year of data will be 'lost' at the beginning and end of the series to which the Lanczos filter is applied. For simplicity, no tapering (taper) or detrending (dtrend) was performed. 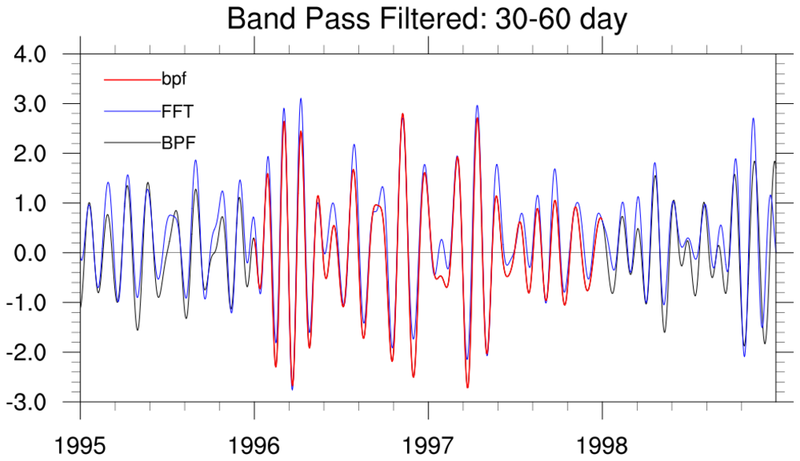 If the BPF line is considered "truth", then, in this case (a fairly broad band pass), the FFT approach yields similar results to the BPF over the temporal window subperiod. There are some minor phase differences outside at the 'ends' and one issue in 1997 but, overall, pretty good agreement. In addition, there is apparently no loss of data at the beginning and end of the sub-period. Why not use the FFT approach all the time? If the number of weights had been kept the same, but the band pass period was much shorter, then the fourier synthesis would likely show more distinct differences. This demonstrates one 'problem' with using boxcar type truncation of Fourier coefficients in the frequency domain. Consider a series of length N (here, N=1000 days) which will have N/2 frequencies (0 to 0.5 cycles/day). 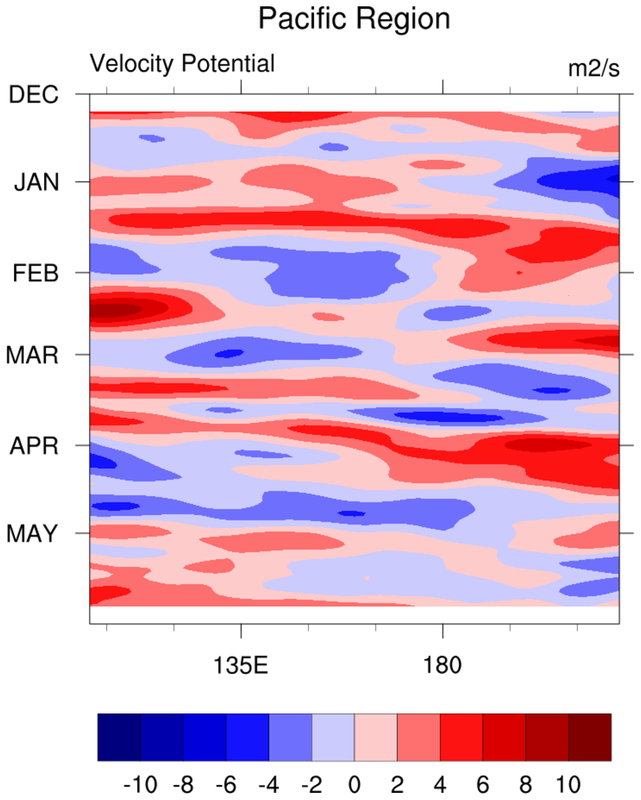 In this example, the 20-100 day band pass period suggested by MJO Clivar will be used. number of weights to yield the boxcar frequency response. 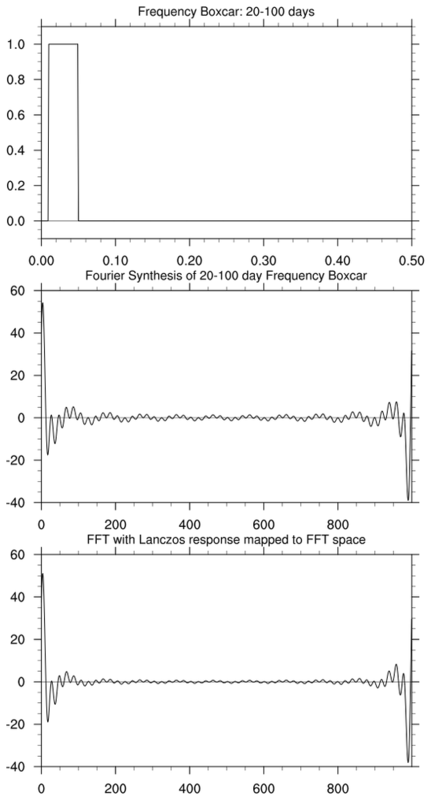 The middle figure shows that a Fourier synthesis of the boxcar Fourier coefficients yields spurious and significant 'end-effects' and, in this idealized case, minor ripples at all times. In the real world, the real and imaginary coefficients are not all equal [here, 1.0], the synthesis can have additional unwanted effects. The reconstructed series can reflect local and, possibly, significant (in time) occurring features. Is there a way to use an FFT and get the desirable and predictable characteristics Lanczos weighting? 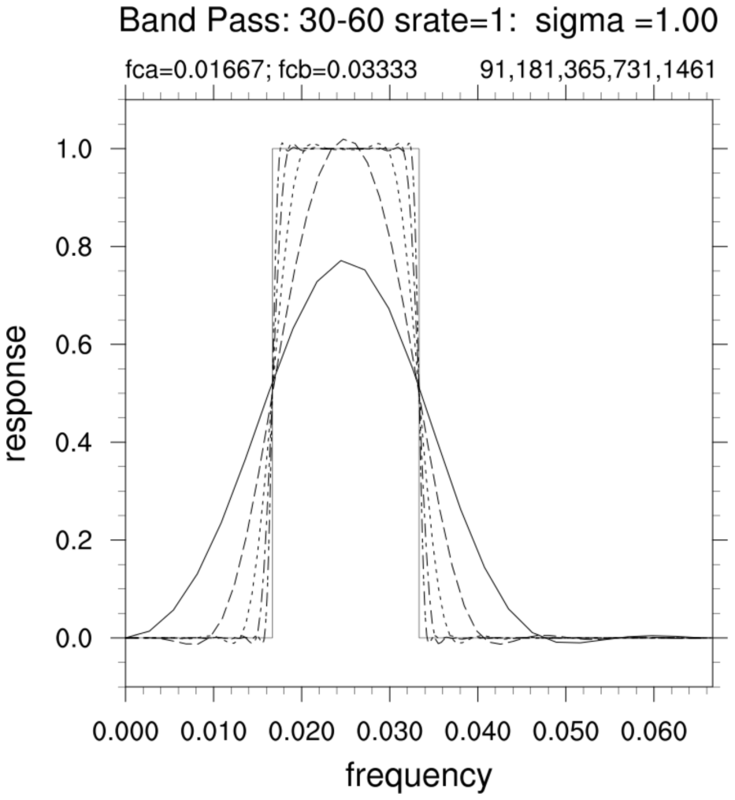 Weighting the boxcar Fourier coefficients by the Lanczos responses yields slightly smaller ripples and end-effects (bottom figure). Punch line: The Fourier approach yields values but you are not quite sure of what you are getting. At least with the Lanczos filter approach, you know what you are getting. (c) Apply the mapped weights to the Fourier coefficients. (d) Perform the Fourier synthesis. (e) In the time domain, manually set the end-points to missing. There is no way around this!!!! filters_7.ncl: Matching data with different sampling intervals. The figure shows a comparison. Do they match exactly? Of course not! (a) Information was lost by sampling every 3rd day. There is no way to recover this lost information; (b) the sereies are not plotted at the exact same time points. Does the new filtered series capture the essentials of the fully samples series? Yes! This script will generate one or more response functions for different Lanczos filter lengths. This allows users to assess which filter length is acceptable for their application. There is a trade-off amongst bandwidth, filter length and response. This example was run twice to get the 2 figures. This script will generate one or more response functions for different Butterworth pole values. 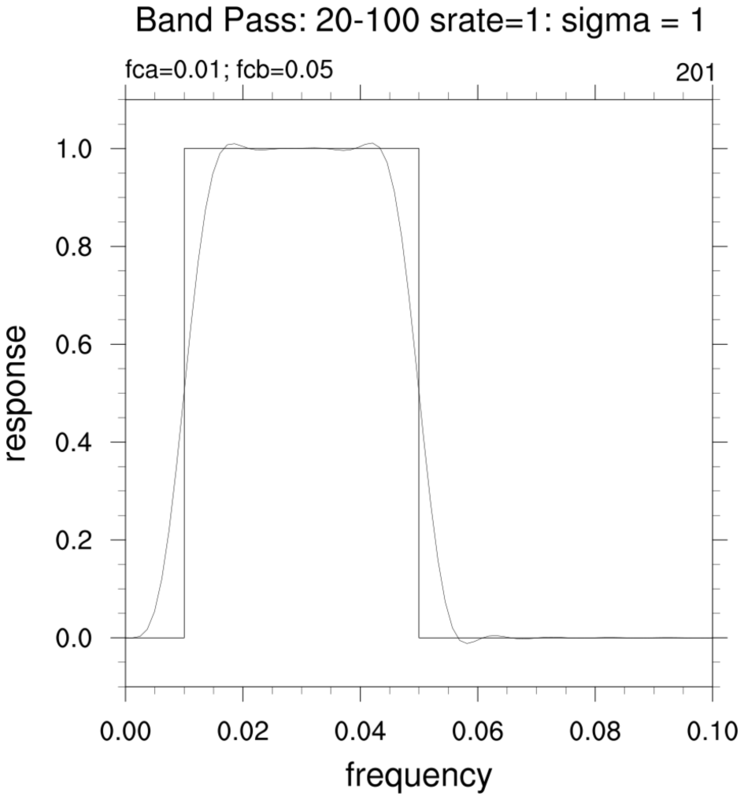 The left figure shows the bandpass relative to the full frequency span. The right figure shows a blowup of the region of interest. bfband_1.ncl: This script reads a time series at a user specified grid point. It applies a Butterworth band Pass filter (bw_bandpass_filter) to the series. 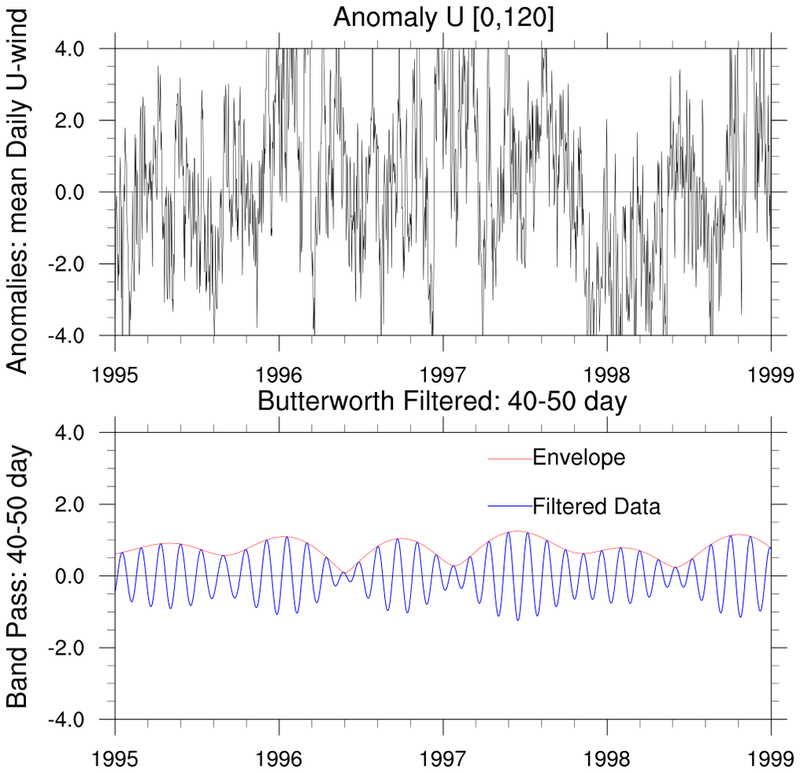 The raw (top) and filtered/envelope (bottom) series illustrates usage and results. 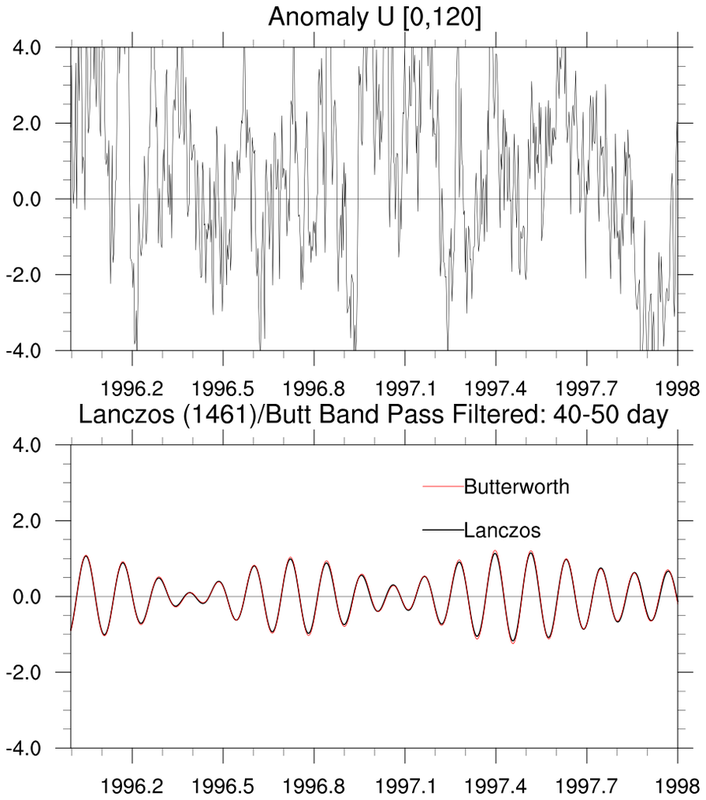 bfband_2.ncl: Use Lanczos filter (filwgts_lanczos) with 1461 weights (=4*365+1) to filter a long time series. Basically 2 years of daily data are lost at each end of the series. Also, apply a Butterworth filter (bw_bandpass_filter). No data are lost. The rightmost figure shows the beginning of the full time series. 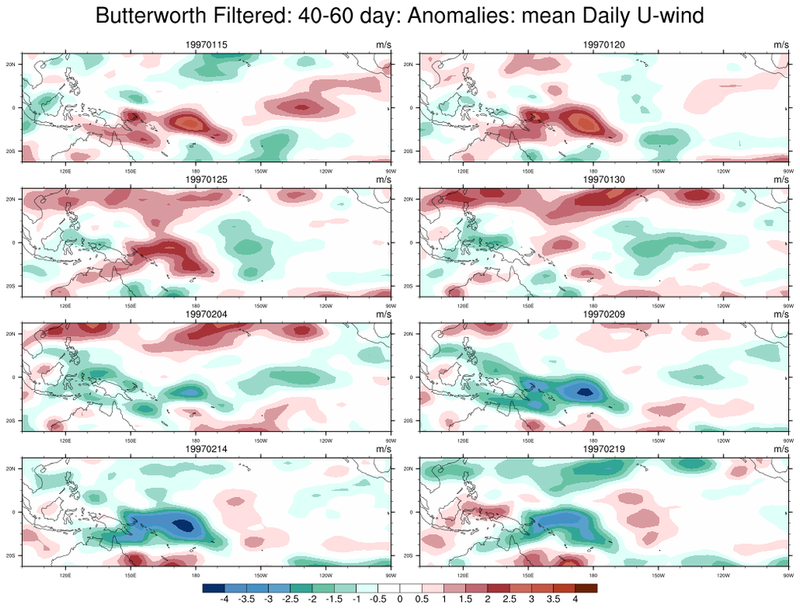 bfband_3.ncl: Plot spatial patterns of 40-50 day Butterworth band passed data every 5 days.